In the fall of 2010 the Nordic prime ministers collectively called for a global shift towards green growth. The Nordic countries will strive to create the conditions for a better climate while also creating economic growth and new green jobs. A common borderless electricity market, energy-efficient innovative solutions in construction, and a continued focus on green R&D are priorities within the Nordic cooperation towards a green economy. The Nordic countries also aim at using their environmental technologies to enhance competitiveness while reducing oil imports and CO2 emissions. The current focus areas of the Nordic cooperation on sustainable consumption and production more specifically are cleaner technologies and innovations, green public procurement, environmental information and sustainable lifestyles. These are all highly important areas in the transition to greener markets. Development of policy instruments and creation of conditions for increased material and energy efficiency through, for instance, Nordic contributions to the implementation of the EU directive on eco-design and to the new waste framework directive. Improvement in co-ordination and use of various environmental information instruments, for instance, between the Nordic Ecolabel (the Swan), the EU Ecolabel (the EU Flower), environmental and other labels. Stimulus of continued development of technology purchases and public procurement contributing to increasing the share of ecoinnovative and cost-effective goods and services in the market. Development of climate aspects within the framework of the Nordic Ecolabel. Promotion of sustainable consumption and production through the creation of legal conditions and economic policy instruments. The Green Economy Coalition is a diverse set of organisations and sectors from NGOs, research institutes, UN organisations, business to trade unions. The coalition has come together because it recognises that our economy is failing to deliver either environmental sustainability or social equity. In short, our economic system is failing people and the planet. Their vision is one of a resilient economy that provides a better quality of life for all within the ecological limits of the planet. Their mission is to accelerate the transition to a new green economy. Every country around the world has its own set of ecological, economic and cultural contexts. 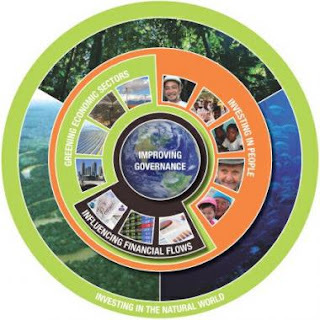 The dimensions of a green economy - and the road towards achieving it - will be specific to that unique context. and explicitly helping in-country civil society organisations gain access to international processes. But it is also helping to kick-start the longer term deeper change, which goes beyond terminology. It is fundamental for the vitality and future of a green economy that it is owned, powered and defined by nations and their citizens. The coalition member International Institute for Environement and Development (IIED) has worked closely with national partners to coordinate dialogues in Brazil, India, Mali and the Caribbean, and EcoUnion hosted a national dialogue in Spain to explore a green economy in the Euro-Mediterranean region.